Classic Grills is now providing filters on our air return grills. At this time, filtered air return grills are available in aluminum. Our Round Custom Grills - Registers - Vent Covers, now with dampers! are now available with dampers as well as screens. Pictured below in a black finish, Octogon Grills and Registers and vent covers are available in several popular sizes. Classic Grills custom air vents, air register covers and quality handcrafted grilles are available nationwide and in Canada! Personalize your indoor or outdoor living areas with our Victorian themed air vent covers, grill covers or vent covers. Does your indoor arboretum or garden need matching grill covers over any unsightly openings? Enhance your botanical garden walls with our Victoria themed covers. Complete your outdoor living spaces by using our Victorian themed coverings available in a variety of sizes. Are you a fan of medieval swords, renaissance clothing, shelds, helms? 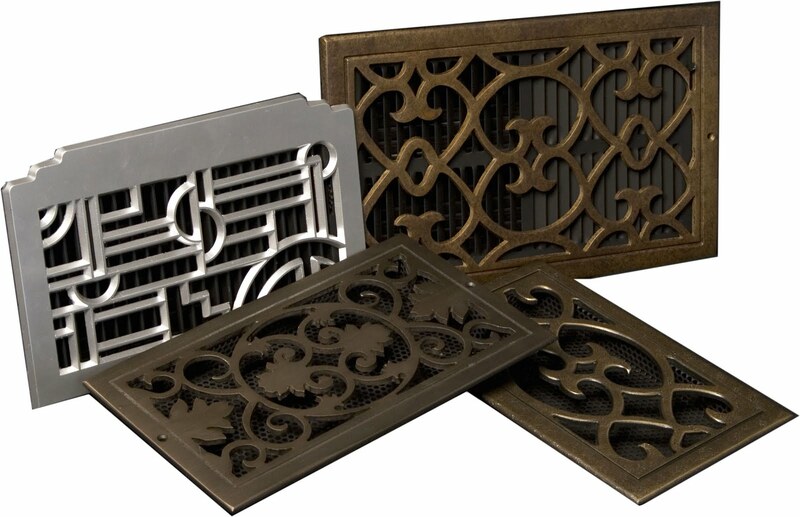 Complete yourself with all things medieval in your home with renaissance themed air vent covers, air register covers and more! 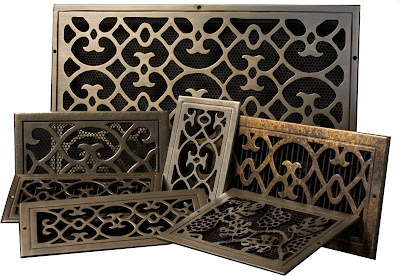 Renaissance Grilles / Registers / Vent Covers are available in over 200 sizes in both rectangular and round shapes. Is your outdoor entertainment space a tropical paradise? Complete your tropical theme with Classic Grills Tropical Themed air registers, grills and vent covers! Have you been looking for an elegant way to deal with an opening into your home? Maybe it's an attic vent that looks so oh-ho-hum that you'd like to upgrade? Upgrade your home's curb appeal with a custom vent cover! Custom air vent covers, air return registers and more are available in over 200 sizes. What are dampers? Dampers are installed on all of Classic Grills standard-sized air supply grills - our dampers are black, resembling louvers...with a wheel lever for accurately regulating air control. 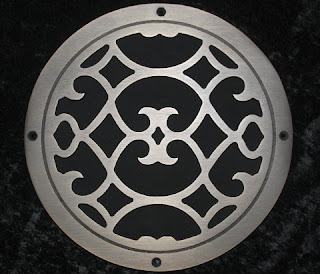 Our round custom bronze speaker grill above is finished in Dark Oil Rubbed Brozne. Make your home entertainment center pop in your home! Speaker Covers and Speaker grills are available in several popular sizes and finishes. Dave Tilley, owner of Classic Grills has over thirty years experience in the heating and air conditioning industry. Seeing beautiful homes with standard tract-type grills, registers and vent covers installed within those homes and on those homes' walls moved Dave Tilley to create Classic Grills to give your home the finishing touch. Our Grills blend beautifully with Home Restorations, Renaissance Houses, European and Country-style homes.